Move aside March Madness and make way for matcha madness! Matcha green tea is having its moment, which is long overdue. If you’ve slurped a green tea frappe at your favorite teahouse or coffee shop, or licked a scoop of green tea ice cream, chances are high that you’ve tried this Japanese green tea.It is the darling of pastry chefs and has been building in popularity on Pinterest and Instagram. If you’ve been wondering why matcha is taking off, look no further than wider availability, thanks to coffeehouse chains, the purported health benefits of drinking the whole leaves, and its winsome flavor. With a few quick tips and a recipe, you’ll be in the know and cooking with green tea in no time. To make matcha, shade-grown green tea leaves get stone-ground into a superfine powder. This green tea is often sold in proximity to matcha whisks, with flat ends that curl at the edges to break up any bits of tea as it blends into hot liquid. Most teas involve dunking a tea bag for several minutes into hot water or pouring hot water over loose tea, and the bag and leaves are later removed. Making a cup of matcha, on the other hand, means drinking the whole leaf, since the powder gets integrated into the water, along with all of the health benefits inherent in green tea. Many grades of matcha exist, from ceremonial to culinary grade. When selecting matcha, the brighter the green, the higher the quality and the more pronounced the flavor. It’s easy to become a matcha lover after you’ve tried it frothed into a green tea latte or whisked into a cup of hot water. But the real beauty of matcha is how it invites you to think outside the teacup. A little bit goes a long way to impart its cheery green color and grassy, nutty flavor into your favorite foods. In my cookbook “Steeped: Recipes Infused with Tea,” matcha makes its way into breakfast, lunch, and dessert. Try thinking of this green tea as a spice and the ideas will begin to percolate. Add a teaspoonful to your morning smoothie for a lightly caffeinated kick. Stir a pinch into buttercream frosting for festive, naturally green cupcakes. Fold in flavor and its characteristic bright green color into a batch of oven-baked granola. Take it savory and make a green tea cream sauce in which to slather noodles or think about sprinkling it into your next pot of rice. The possibilities are endless. Make breakfast easier by stirring it together the night before with this easy Matcha Chia Pudding Parfait. When protein-packed chia seeds come into contact with yogurt, they expand and take on a jelly-like crunchy consistency. 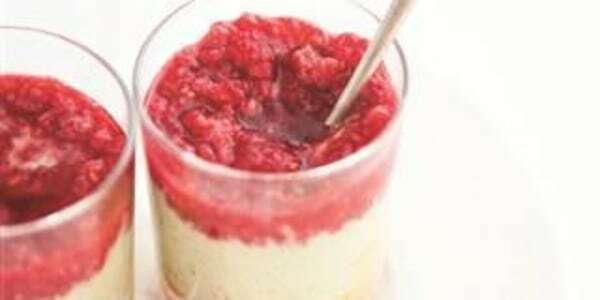 Paired with pureed raspberries and peaches, this mildly sweet pudding makes a filling, healthy breakfast. This article was originally published Mar. 20, 2015 at 9:11 a.m. ET.